To make way for the monument, nearly forty square blocks of riverfront property were demolished. The demolition began during a public ceremony on October 9, 1939. City leaders only gained traction for the project once it was framed as a monument to President Thomas Jefferson. The "Park Over The Highway" project, commonly known around town as "the lid" portion of the CityArchRiver plan, has a contractor. The Missouri Department of Transportation announced Wednesday that St. Louis contractor KCI Construction had the winning bid for the project. At $26.4 million, MoDOT said KCI's bid was also the lowest submitted. 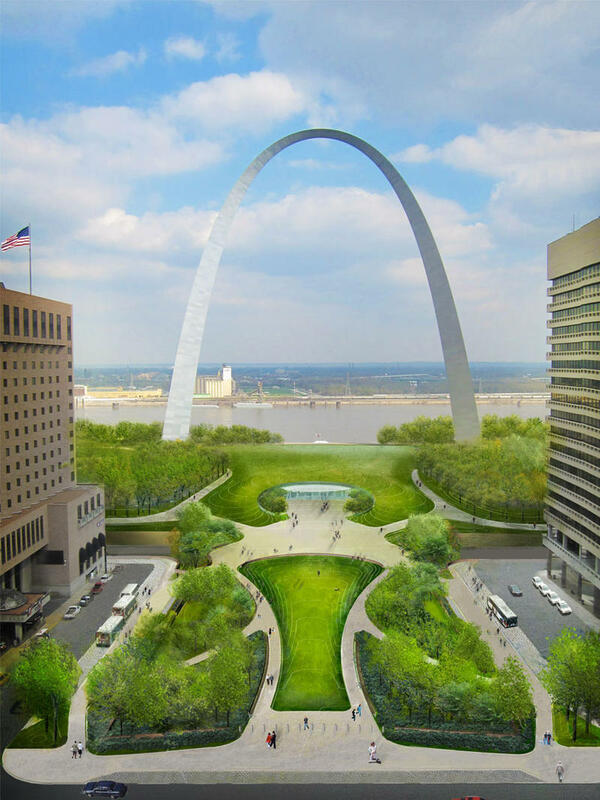 The renovation of the Gateway Arch grounds is being called a “magnificent project” by two presidential cabinet members. 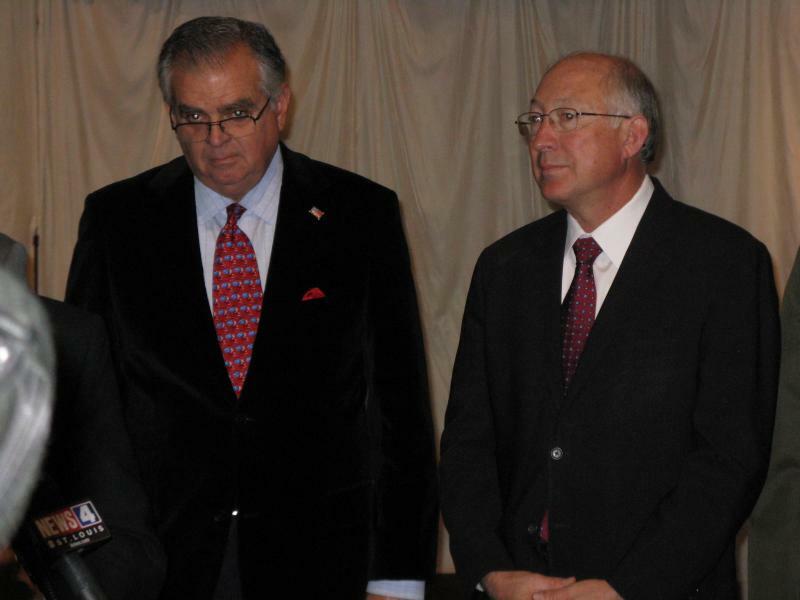 Interior Secretary Ken Salazar and Transportation Secretary Ray LaHood were in St. Louis Wednesday to celebrate a new $20 million federal grant for the project. The grant will help pay for a new “pedestrian lid” over Interstate 70 so people can move more easily between the Arch and downtown St. Louis. This article first appeared in the St. Louis Beacon, Sept. 21, 2011 - Landscape architect Michael Van Valkenburgh was in Forest Park Tuesday to give his peers a rundown on plans for the redesign of another grand civic park, the Jefferson National Expansion Memorial, better known as the Gateway Arch, and its surroundings. This article first appeared in the St. Louis Beacon, Aug. 17, 2011 - My perception is that pretty much every one, no matter his or her political persuasion, is fed up with the constipation of our nation's government. So it was extraordinarily good news last week to read Jo Mannies' report in the Beacon that $2 million being allocated for work on the Arch grounds project. And how appropriate that this money will go to remove a major obstacle that exists between the Arch grounds and downtown. This is a small but critical piece of the big overall Arch renovation-reconnection plan. Late Friday afternoon, William Lacy Clay, D-St. Louis, announced that the Jefferson National Expansion Memorial, also known as the Gateway Arch and its grounds, has received a federal transportation grant. 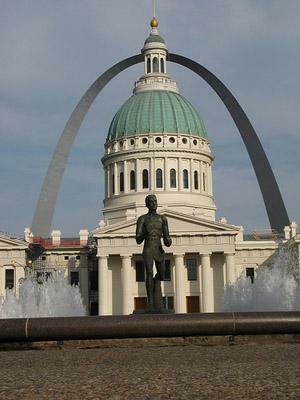 The grant will help fund engineering and planning for a pedestrian connector linking the Arch and downtown St. Louis. Kiener Plaza is likely to be the first portion of the Gateway Arch project to be completed. Those familiar with the project say it's slated for completion in the fall of 2013. The plan for the Plaza includes a performance pavilion, an eating venue, seating, and water features. Walter Metcalfe with the CityArchRiver 2015 Foundation, the group that sponsored the design competition, said work on Kiener Plaza can move forward more quickly because it's not part of the National Park. This article first appeared in the St. Louis Beacon, Dec. 20, 2008 - Making a connection between downtown St. Louis, the Gateway Arch and the Mississippi riverfront has been on the region's letter to the Santa Claus for decades. Saturday afternoon, a small but well-connected and well-informed group of citizens came together in the hope of doing something about the situation -- and doing it pronto. 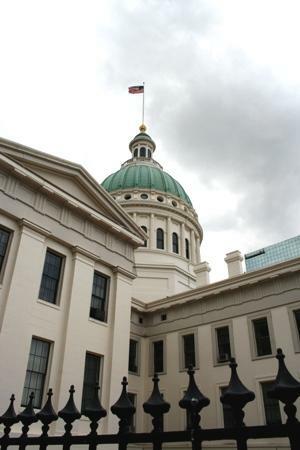 This article first appeared in the St. Louis Beacon: November 10, 2008 - Plenty of politicians and urban planners have had their say about how to better connect the St. Louis riverfront, Arch grounds and downtown St. Louis. It's been a long-running and quite controversial dialogue -- one continued by a panel of design experts and other stakeholders Friday at Washington University (more on that later). This article first appeared in the St. Louis Beacon: October 22, 2008 - The National Park Service has selected its preferred plan to improve the grounds of the Gateway Arch -- but there are still questions. After months of back and forth with the public about ways to improve the Gateway Arch grounds, the National Park Service has selected its preferred plan. It includes, among other things, a design competition to generate even more ideas. 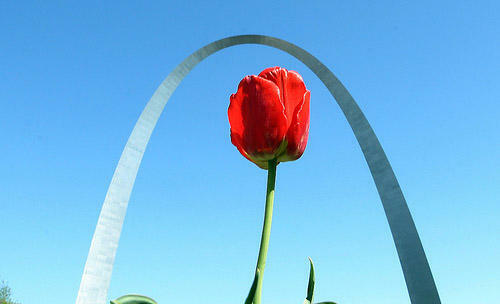 This article first appeared in the St. Louis Beacon: July 4, 2008 - That is our Arch. So, it's not surprising that area residents are paying a good deal of attention these days to proposals and discussions about what to do with the 91-acre national park the Arch soars above – a site that attracts more than 3 million visitors a year. Arch grounds: change or not? This article first appeared in the St. Louis Beacon: June 26, 2008 - Former Missouri Sen. John C. Danforth believes the National Park Service has made up its mind against any changes or improvements to the grounds of the Jefferson National Expansion Memorial. He described a meeting last night in Forest Park, and another one next week at the Old Courthouse downtown, as "window dressing." 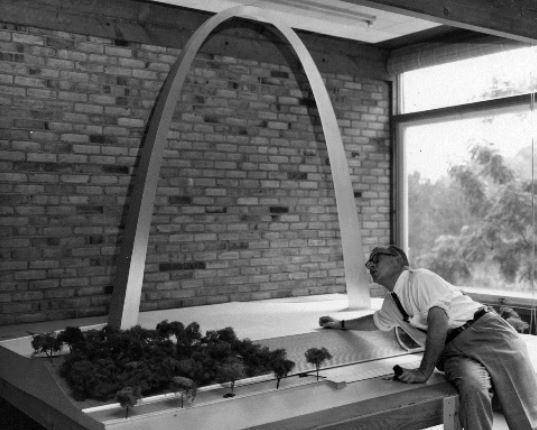 This article first appeared in the St. Louis Beacon, June 9, 2008: The National Park Service won't be replacing the Gateway Arch's gleaming stainless steel with, say, yellow enamel paint (or installing a drive-thru window), but if you have an idea for improving the grounds surrounding the 630-foot memorial, now is the time to speak up. Arch superintendent Tom Bradley says that two upcoming "open house style meetings'' are designed to get people thinking about ways to improve the Jefferson National Expansion Memorial, which includes the Arch and Old Courthouse. There won't be an official presentation, but rather stations where five "preliminary alternatives" will be explained, and where people can ask questions and makes comments. This article first appeared in the St. Louis Beacon: May 28, 2008 - What is your vision for the Gateway Arch grounds? The National Park Service is inviting the public to weigh in on plans for the Jefferson National Expansion Memorial at "open house style meetings'' on June 25 and July 1. The Memorial includes the Arch and Old Courthouse.